August 6, 2015, Saitama City, Japan - Tamron Co., Ltd. (President & CEO: Morio Ono), a leading manufacturer of precision optics, today announces the introduction of a new high-performance lens that zooms from 18 to 200mm for APS-C DSLR cameras. The new 18-200mm F/3.5-6.3 Di II VC (Model B018) is the successor to AF 18-200mm F/3.5-6.3 XR Di II LD Aspherical [IF] MACRO (Model A14), which has been one of Tamron's best-selling lenses since its introduction 10 years ago. The new 18-200mm VC uses the most modern optical and mechanical design to achieve compactness and high performance. Incorporating image stabilization, the 18-200mm VC delivers superior image quality and is the lightest zoom in its class. Tamron made full use of its long experience and expertise as a pioneering force in high-power zoom lenses to create an optimal all-in-one lens that opens up new photographic possibilities to all DSLR camera users. A zoom range of 18 to 200mm (35mm equivalent: 28-310mm) means there is no need to change lenses even when switching from wideangle shots in tight places to long telephoto shots of distant objects. Ideal for everything from large groups photos, family pictures, portraits, scenery, animals and school events—even for close-up shots (less than 0.5m / 19.7 in.) of food. Covers the focal length range of 18 to 200mm and features Tamron's VC (Vibration Compensation), but weighs a mere 400g (14.1 oz.). 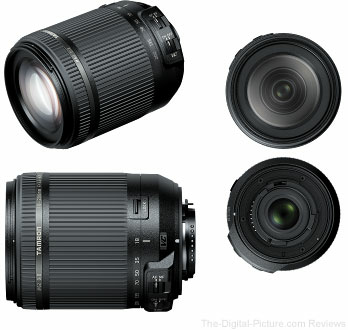 Tamron designed the 18-200mm VC to be as user-friendly as possible by emphasizing portability and convenience. Users will appreciate the incredible balance and comfortable feel of this lens—even when used with the newest APS-C DSLR cameras. Camera vibration is magnified in telephoto shots and when a slow shutter speed is used because of dim lighting. Even beginners can take great photos at long distances, at night, and indoors—and avoid camera shake—thanks to Tamron's acclaimed VC mechanism. By incorporating a newly designed autofocus drive module with optimal DC motor-gear train integration, the 18-200mm VC also focuses much more quickly and quietly than models with conventional DC motors. Featuring 16 elements in 14 groups, the 18-200mm VC uses an LD (Low Dispersion) lens element to minimize chromatic aberrations. Although light and compact with VC, Tamron's new offering also delivers amazing overall optical performance for an all-purpose lens. A circular, seven-blade aperture diaphragm maintains an almost perfectly round shape even at two stops down from its maximum aperture, providing desirable and beautiful bokeh with point light sources blurring into naturally rounded shapes. The Canon and Nikon mount models will be simultaneously launched August 20, 2015. The launch date of the Sony mount model will be announced at a later date.